ANAHEIM, CA – Disneyland Resort, as “The Happiest Place on Earth”, became especially animated today as the U.S. Postal Service issued a set of four stamps featuring Mickey Mouse, Goofy, Donald Duck and a host of Disney friends. These represent the first of three Disney-themed stamp panes that will be issued over as many years. And thanks to a new set of stamped postal cards and stamped stationery, the Postal Service and Disney are making it easy to write home. 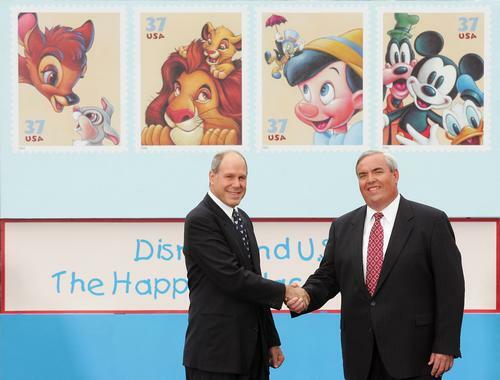 With the dedication today of the Disney stamps, we get the chance to capture the spirit of friendship as it appears in the art, the imagination and the creative tradition of Walt Disney”, said Postmaster General John Potter who, along with Walt Disney Company Chief Executive Officer Michael Eisner, officiated at the first-day-of-issue stamp dedication ceremony in front of Sleeping Beauty Castle in Disneyland park. Said Eisner: The rare honor of being featured on a United States postage stamp is truly special for Disney. We are pleased that millions will have a chance to brighten their correspondence with Mickey Mouse, Goofy, Donald Duck and other Disney friends. As first in the series, The Art of Disney: Friendship, honors friendship as it appears in Disney’s legendary artwork. More than a quarter of a billion stamps were printed. Future Disney-themed stamps will showcase a breadth of quintessential Disney moments. Anaheim, as host city to the event, holds the unique distinction of being the only city in the nation where the stamps, postal cards and stationery are available today. Mickey and his friends, through the magic of The Art of Disney : Friendship , will be available at Post Offices and Philatelic Centers nationwide beginning tomorrow, June 24. The Art of Disney: Friendship self-adhesive 37-cent stamps, available in panes of twenty, feature world-famous Disney friends on four stamp designs. � Mickey Mouse, Goofy and Donald Duck as the perfect fun-loving group. Mickey Mouse made his debut on Nov. 18, 1928, in the first synchronized sound cartoon, �Steamboat Willie.� With help from his pals Goofy and the �fowl-tempered� Donald Duck, clever little Mickey quickly became an American icon. � Bambi and Thumper as childhood best friends. A friend can make good times even more fun and make bad times more bearable. In Walt Disney’s “Bambi” (1942), an energetic rabbit named Thumper becomes a lifelong friend to a young deer. Thumper accompanies Bambi in both pleasurable pursuits, such as their winter adventures on ice, and in adversity. � Mufasa and Simba show the powerful bond between parent and child . Our parents can be our best friends, as the cub Simba learns in “The Lion King” (1994) when his father, Mufasa, comes to his rescue after Simba is chased by hyenas. Simba idolizes Mufasa and hopes to grow up to be just like him. The Disney relationship with the Postal Service began in 1933 when Mickey Mouse starred in the animated short “Mail Pilot”. The achievements of Disney were first recognized on a stamp in 1968. On the stamp, a parade of children, hand-in-hand, emerge from a tiny castle to surround a portrait of Walt Disney. The children, from many nations of the World, are garbed in native costume. In 1998, a �Snow White� stamp was issued as part of the Postal Service’s “Celebrate the Century” stamp series that highlighted the most memorable and significant people, places, events and trends of each decade of the 20 th century. In 1937, �Snow White and the Seven Dwarfs� premiered as the nation’s first feature-length animated film. The movie classic was comprised of 240,000 separate drawings and won a special Academy Award� for Walt Disney. The 37-cent stamps and the booklet of twenty, 23-cent stamped postal cards will be available at Post Offices and Philatelic Centers nationwide on June 24. A colorful 37-cent stamped stationery pad containing 12-sheets of the four designs will make it even easier to keep in touch with friends � and it’s just $14.95. The stationery pad will be available in select Post Office locations and at Philatelic Centers. � Disney Cancellation Keepsake for $10.40, four first-day cover envelopes with one each of the stamp. To see The Art of Disney: Friendship stamps visit the online Postal Store at www.usps.com/shop and click on �Release Schedule� in the Collector’s Corner. Current U.S. stamps and stationery, as well as a free catalog, are available by toll-free phone order at 1 800 STAMP-24. In addition, a selection of stamps and other philatelic items are available at the online Postal Store at www.usps.com/shop . Custom-framed prints of original stamp art are available at www.postalartgallery.com . Since 1775, the U.S. Postal Service has connected friends, families, neighbors and businesses by mail. An independent federal agency, the Postal Service makes deliveries to more than 141 million addresses every day and is the only service provider to deliver to every address in the nation. The Postal Service receives no taxpayer dollars for routine operations, but derives its operating revenues solely from the sale of postage, products and services. With annual revenues of more than $68 billion, it is the world’s leading provider of mail and delivery services, offering some of the most affordable postage rates in the world. Moreover, today’s postage rates will remain stable until at least 2006. The U.S. Postal Service delivers more than 43 percent of the world’s mail volume – some 202 billion letters, advertisements, periodicals and packages a year – and serves seven million customers each day at its 38,000 retail locations nationwide. After applying the first-day-of-issue postmark, the Postal Service will return the envelopes through the mail. There is no charge for the postmark. All orders must be postmarked by July 22, 2004.